Wapens van voorsicht en van wysheyt sijn van noot. Die wij als t'eenich hooft van alle wijsheijt eeren. Qui est seul chef, & nostre sapience. N'a de son corps, ains du chef souuenance. 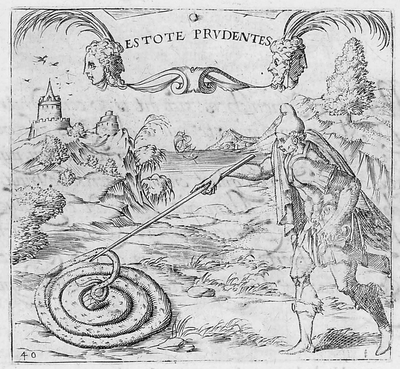 Aprenons donc prudence du serpent. Vulnere, sollicita contegit arte caput. Hinc spiranda omni corpore vita venit. Lethal wound, it protects its head with artful care. Here lie the dwellings of the soul, the sanctuary of the truth. Hence comes life that is to be hoped for by every body.